I understand that April is National Poetry Month. I don’t know a lot about poetry. I like to listen to the Rhythm of a good poem. Poetry sounds nice to my ears. I try to get my reading buddies to read poetry to me, but I’m not always successful. 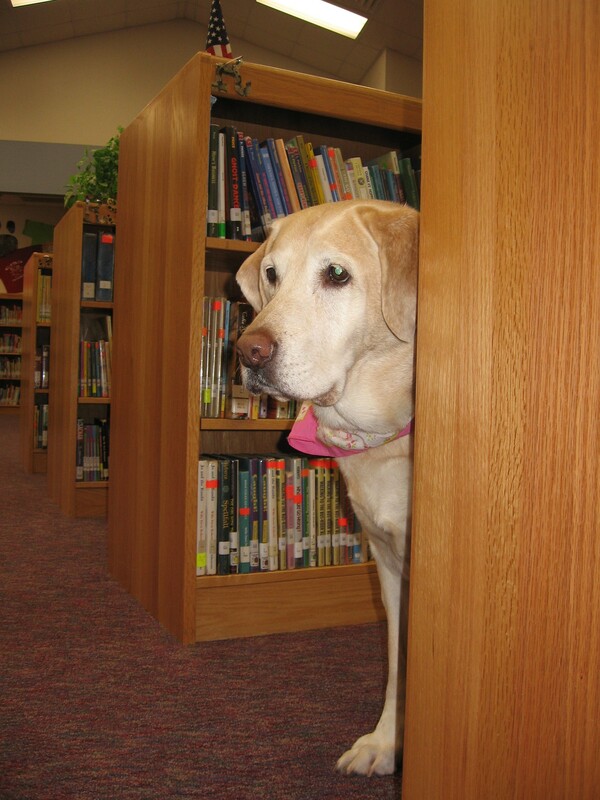 When I was the official Library Dog at school I seemed to have better luck steering kids to poetry books. I even had some kids writing poems about me! She likes to sleep and sit. Rhythm is who she is. Now those are unbelievably lovely poems!! But I also have an unbelievably fantastic book for you as well! After all, this IS Perfect Picture Book Friday! At the end of the book are several pages with notes about each of the breeds described in the poems. It is a book for dog lovers and lovers of poetry alike. Of course if you are going to read a book of Haiku with your little people, then you must have them create their own Haiku! You can read about Haiku at Poets.org HERE. You might also visit the Haiku Society website HERE. And after all of that, you might want to venture over to Susanna Hill’s blog for a list of Perfect Picture Books and some great resources to go with! We’ve been on a book binge! An ABC Book Binge! I like the sound of that — Book Binge. It seems to happen a lot around here. I’m not sure what precipitated (nice word!) this particular binge. I think the Mom Person was cleaning book shelves and got stuck on the shelf with the alphabet books. 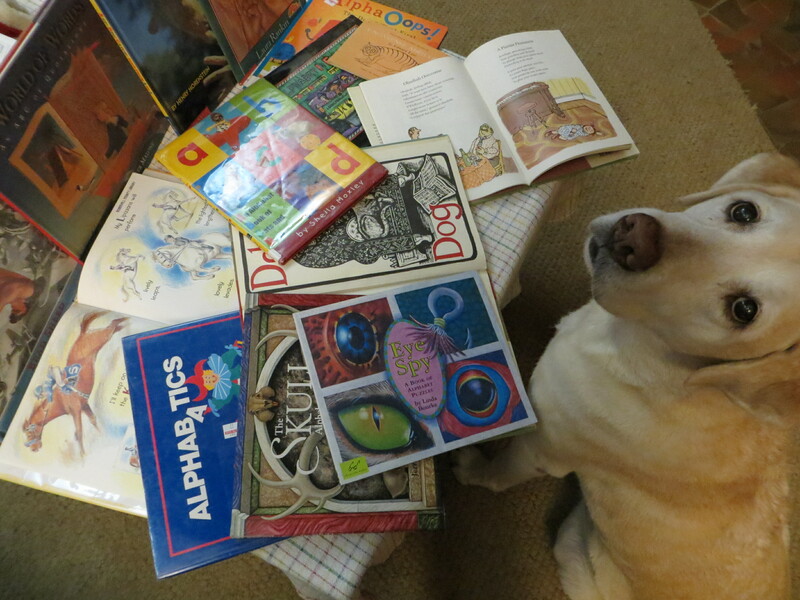 She kind of likes ABC books and is always on the lookout for interesting ones. We have quite a collection. 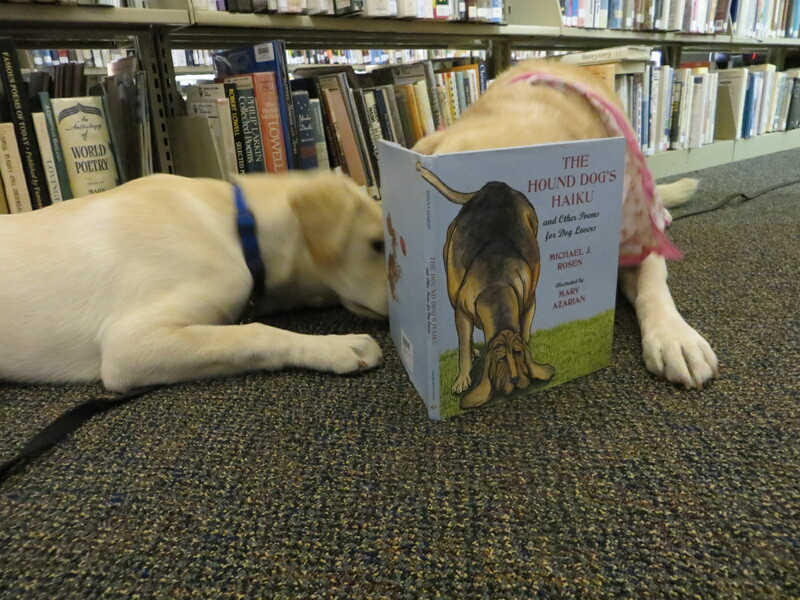 So anyway, she got stuck enjoying the ones on our shelves and then we went to the library and found some more. There sure are a lot of different ways to learn the alphabet!!! I know some of the alphabet. “R” means river, “C” means come to the Mom Person. That snaky sound “S” means sit. “D” means down. And the “enh,enh” sound means don’t do that! I know that that’s not the whole alphabet. And I don’t think that it’s in the correct order. But I’m learning. One of the books that we looked at was a mixed up alphabet. Alpha Oops! The Day Z Went First. Written by Alethea Kontis and illustrated by Bob Kolar. Published by Candlewick Press in 2006. This book was pretty silly. Z decided it should be able to go 1st. Then all the other letters decided to go in a different place. And then they argued about who got the most words attached to their letter. It started with Z is for Zebra. And ended with A is for apple, accident, accordion, acorn, acrobat, airplane ……………. 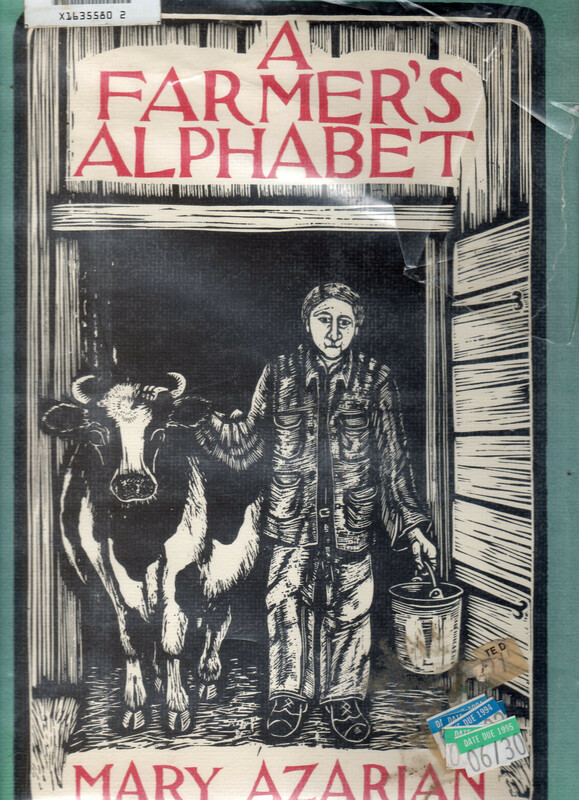 A Farmer’s Alphabet is a beautifully simple book written and illustrated by Mary Azarian. It was published by David R. Godine in 1981. 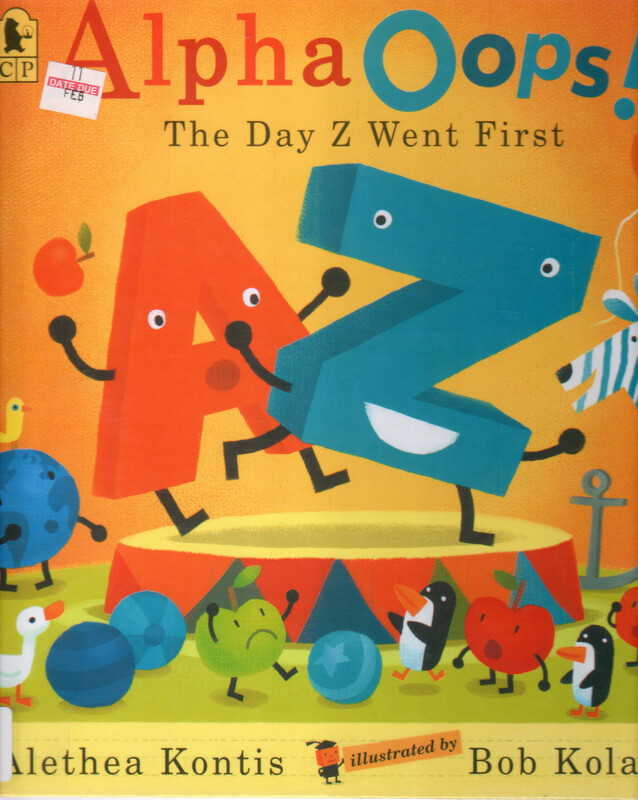 It’s a straight forward book with A is for apple, D is for dog, …….. Z is for zinnia. But it has some beautiful woodcut prints to go with each letter. At the end is a 2 page “note” from the author about the making of the book and about the process of woodcut prints. This is a treasure of a book. 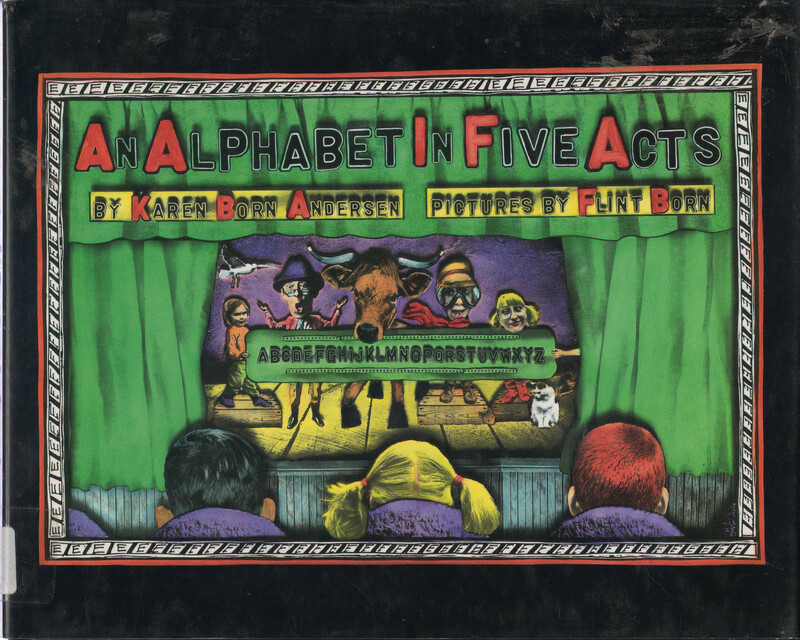 An Alphabet in Five Acts by Karen Born Andersen with pictures by Flint Born is a very unique ABC book. It was published by Dial Books in 1993. It is a play! A play on words you might say! It begins with Act 1 – Another Bad Cat Doesn’t Eat. This book is soooo funny! The pictures are kind of mish mash photos and artwork. There is a note at the end of the book about how they were created. The Mom Person particularly likes this book because it is one of her favorite games. When we drive in the car she’s always making up alphabet sentences. ” A Ball Can Drop Eleven Feet ……. She always gets my attention with the “B” for Ball! Then she drones on. The Handmade Alphabet is by Laura Rankin. It was published by Scholastic in 1993. It’s another pretty straight forward ABC book. But it has no words. Just the letter and a picture. 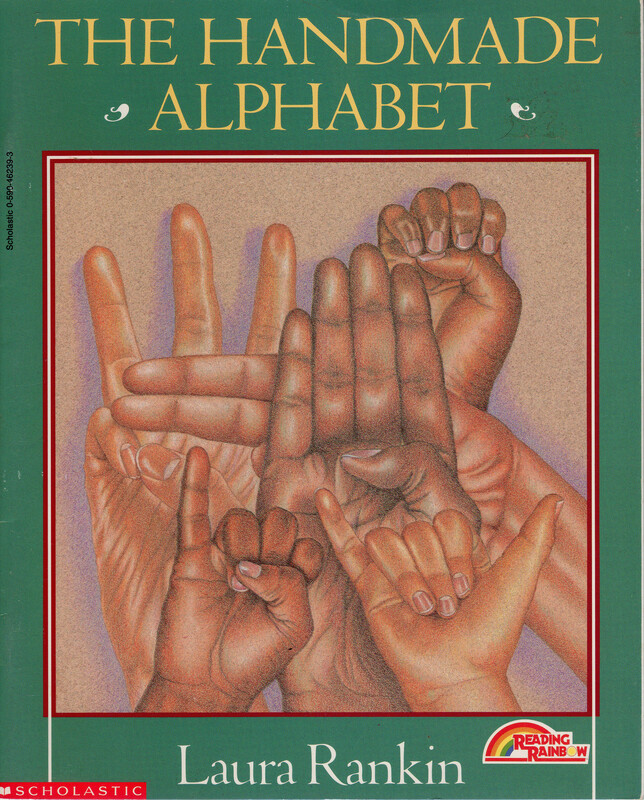 What is unique about it is that each letter shows the corresponding hand sign from the American Sign Language. And in each picture the hand is making the sign and holding an object that starts with that letter. Some of the kids that we visit use this alphabet. I know the sign for “more” and “enough”! And my favorite for today! 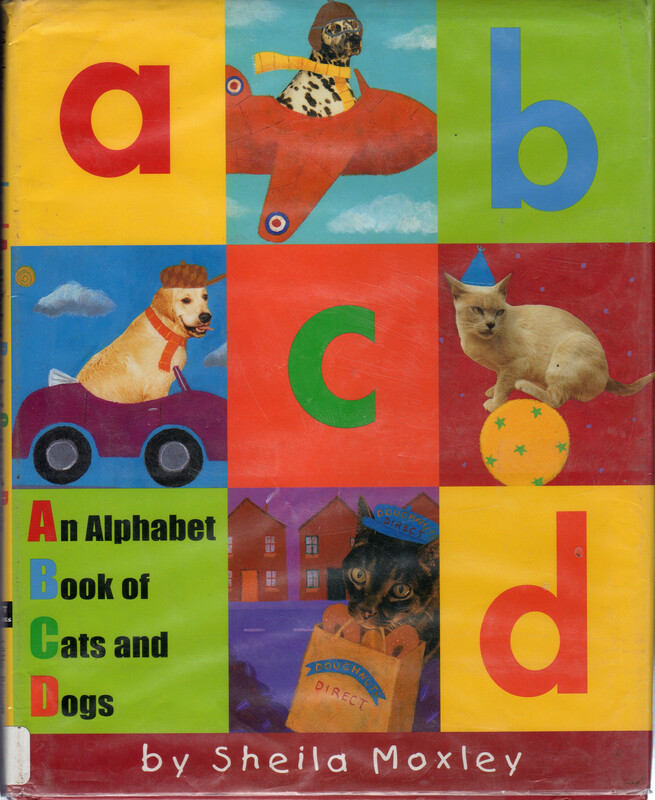 An Alphabet Book of Cats and Dogs by Sheila Moxley. Published by Little, Brown, and Co. in 2001. This book cracks me up!!! The illustrations are photo collages with cats and dogs in silly situations. 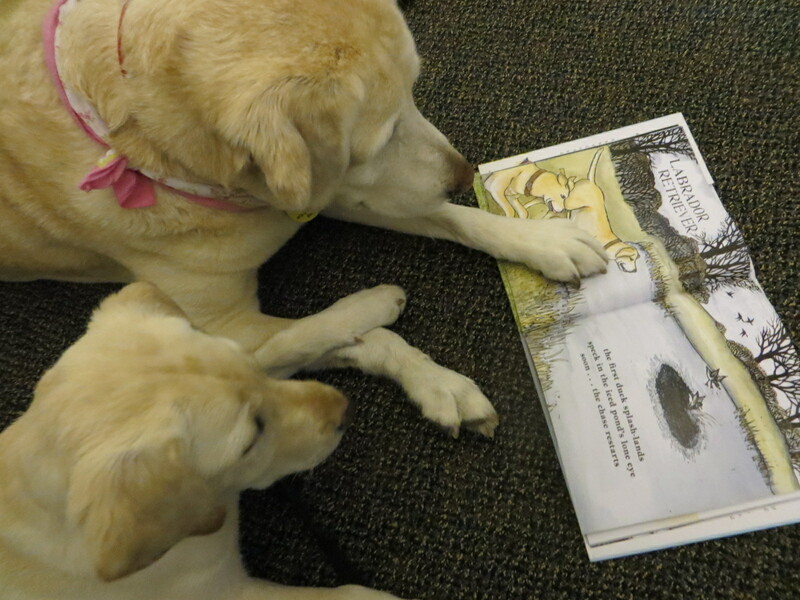 It starts with “Aa – Arnold is an amazing aviator.” Notice that cute yellow Lab on the cover? It’s not me, but it could be. Tomorrow I might tell you about some of the others that we read. But for now you can mull over these and then go out and find some ABC Books for yourself! If you have any interesting ones you would like to recommend, it would be muchly appreciated!